Sophomore quarterback/linebacker Brandon James is expected to be out of action again this week. 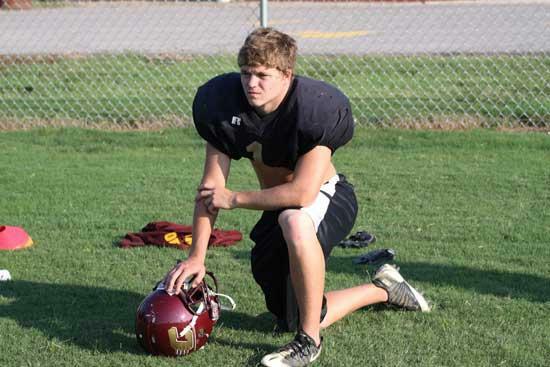 Keeping the top players on the depth chart healthy was Cannon County's biggest key entering the 2010 season. One game into the campaign health already is an issue as three of the team's top all-around players are either out or questionable entering the home opener against West Creek Friday at 7 p.m.
Sophomore quarterback/linebacker Brandon James (shoulder), junior tailback/linebacker Damon Collette, and senior receiver/defensive back Colin Jones all are among Lions in the infirmary. James suffered his injury last week during practice and did not play in the season opener at Spring Hill. Collette (hip) and Jones (hip) were banged up in the Spring Hill game and have been limited at practice this week. James underwent a MRI Wednesday and is likely out for the game against West Creek. The results of the MRI aren't expected until at least this weekend. "I don't see that happening," said Cannon County Head Football Coach Joel Schrenk, when asked if James could play against West Creek. "It would be great to have (James) back for the DeKalb County game, but I wouldn't anticipate him playing this week. Damon and Colin are questionable but I expect both of them to be able to go." Injuries to a trio of players has an impact on six positions as all three are two-way starters. Additionally, it forces Schrenk to move players already at starting positions to man the now vacant ones and tests an already limited roster. "With our depth it's tough but we have to try and get them healthy," Schrenk said. "In the meantime we have been working the younger kids and trying to get them ready in case the others can't go, or can't go as much."